Hello mommies! Summer will start weeks from now. Do you have plans for your little ones this summer? I have so many things in mind for Kenzo. I want him to engage in sports like basketball and swimming. I also want him learn how to play the guitar. There are a lot of things to do this summer and it's not only to train them physically but also mentally. Make your kids summer count! Nurture happy and confident Math achievers with Mathemagis' Singapore Math Summer programs. Preschoolers four to six years old get the “Best Start to be Smart” in Math through our fun and hands-on activities. Young kids develop a love and confidence for math which they will carry with them throughout. Grade school students struggling with Math word problems will get a boost with “Visual Thinking Math” where kids learn the fun and easy way to solve math word problems using Singapore’s proven effective bar model strategy. 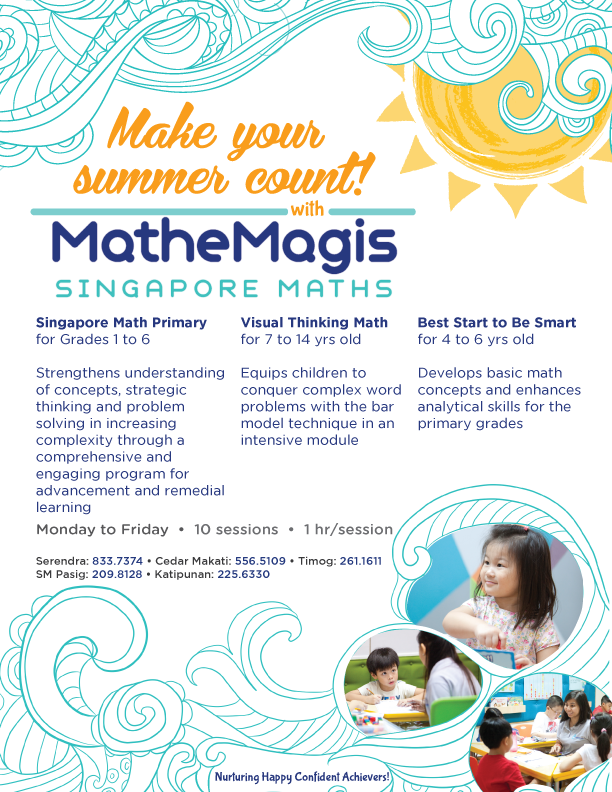 Keep you kids one step ahead of everyone through Mathemagis’ Singapore Math Program for gradeschoolers. This program teaches Math concepts and enhances analytical skills for all students. Kenzo is going to try their program this summer and I'm sure he'll enjoy while learning. I want him to learn Math in a fun and easy way. No no to Math phobia, if there's such a thing. So will I see you mommies in one of their branches this summer? Visit any of their branches in Serendra(833.7374), Makati(556.5109), Katipunan(225.6330), Timog Avenue(261.1611) and SM Pasig(209.8128) You may also register online http://bit.ly/1VF2nmV.